Casa del Desierto - Barstow Ca. Barstow Harvey House - Now renovated and occupied. Train depot marking the center of the Mojave -- These photos were taken pre-renovation. 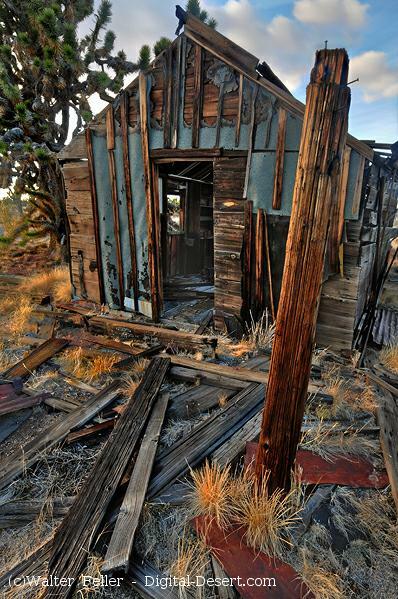 Currently the Kelso Station is being used as the headquarters and visitor center for the Mojave Preserve. Ransacked by thieves and vandals, and now, just a memory. Secluded remains of 1870's cabin -- This cabin has since been renovated, but may have not survived anyway. Current condition is unknown. One room cabin in Holcomb Valley near Big Bear. Mock ghost town between the two valleys. Torn down and longer in existence. This cabin in Cima was more scenic than functional, and since has blown over and collapsed.